This page is a start of my focus on EFI updates for the Corvair. I have several designs I am working on and thought it was time to put some of these out to the public. These designs range from simple street updates to full race systems. Both naturally aspired (NA) and turbo engines will be addressed. Initially I will be using the Microsquirt ECU for my car and for a couple of customers cars. As I get the system tuned and dialed in I'll provide fuel and ignition maps for download. This should help with anybody wanting to add something like this to their car by providing a starting point in the tuning process. 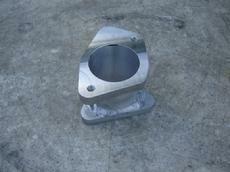 Here is an adapter I made to fit a throttle body onto a stock Corvair turbo. The throttle body is a Holley unit but I am not sure of the application yet. It has a TPS sensor on it and an IAC valve for idle control. The bore is 53MM (2.08") with an area of 3.397 sq. in. I still need to machine the holes to mount the adapter to the turbo. 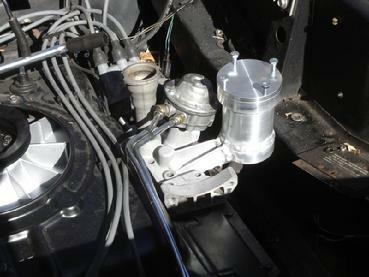 The stock 180 carb has a venturi area of 1.452 sq in. with a bore of 1.375". So this TB will give an increase of over 5 psi. boost. I was going to get the EFI working on my 65 Vert first. But since I purchased the running 64 Spyder Vert this became my EFI car of choice. Here are a couple of pics showing the build process. Original engine as I received the car. I needed room for the crank position sensor and 36-1 ring. So I modified the oil filter housing. Here is the completed adapter for the 36-1 ring. The adapter and 36-1 ring installed onto the harmonic balancer. Working on the linkage design. The linkage is coming along nicely. My son and I worked on it this afternoon and now have the position desired to allow the correct throttle movement. Tomorrow I'll weld the bearing mounts onto the crossover center section. Then fabricate the lever for the throttle body. The linkage is nearly complete. Mounts welded and rod and lever arms attached. The linkage operates very smoothly. Starting to build the fuel lines. Since I've hurt my back and am having a hard time getting anything done I thought I'd update my site a little. Here are the latest shots of the EFI setup on the Turbo. My Son and I have been riding around trying to get the tune set. Not an easy thing for sure. The initial start-up was a real PITA. On the Tunerstudio MS software GUI on the lower right is a small box that says "Cranking" or Not Cranking". Obviously you know what these mean and to the Microsquirt ECU these are very important. If the "Not Cranking" sign is on when the engine is being cranked for start-up the injectors will Not squirt any fuel. This is where I was the first and second days after I had completed all the hookups. After much checking and rechecking my connections and inputs in the settings I decided to look deeper. I noticed on one web page a suggestion to make sure I had the latest firmware version for the ECU. I checked the version that had come with the unit and the latest was a newer version. So, I updated the firmware and guess what? "Not Cranking" continued to blaze away. Now what? Well, I spent a lot more time looking for some kind of answer. I found a post on a forum talking about different firmware so I started looking at the older versions and their discriptions. I found one that was nearly a full point earlier which talked about it being good for a distributor triggered system. I uploaded this version, tried the start-up and the engine fired within 2 revolutions. So the "Not Cranking" problem wound up being a firmware issue and not a case of me hooking something up wrong. I'm not going to tell you how mad I was at this. Ok, so now the engine runs. We can drive it around the neighborhood. The ignition is all stock but is not the trigger for the ECU. I had added a VR sensor and mount on the oil filter housing that picks up the pulses off the 36-1 ring on the harmonic balancer. Actually I had hooked this up before my final firmware upload thinking the dizzy was causing a problem. You'll also notice I switched out the custom oil filter housing for a stocker. I found during cranking there was a small weep of oil from the left side where I had welded the filter "can" to the factory adapter. Since I needed to fit the VR sensor I decided to just add the VR mount to another oil filter housing and run an A/C 90 deg filter mount on the adapter to clear the 36-1 ring. I'll add a VR mount to the custom adapter and correct the weld on that left side. Then use it on another car. The Bosch wideband O2 sensor. This was fun. I had a tough time getting this to read properly. It was stuck at 12.1:1 A/F. I finally found in the Tunerstudio MS program that this sensor had not "burned" into the ECU. Even though I had done this. Now that it is working the A/F is quite jumpy; not very stable. The engine does Not like 14.2:1 A/F so we are trying to keep it in the 13:1 range during light cruise. Seems too rich to me but if I try to lean it out the engine mis-fires. I still need to take the car to a local fuel injection shop and use their chassis dyno to set the A/F correctly. Then I can start to get the accel and warm up enrichments dialed in. I need to put together a short video showing start-up and a short drive. When I roll on the throttle the factory boost gauge does go to 15. Which it never did with the YH carb. So the bigger throttle body is allowing the turbo to spool up higher making more boost. Pretty nice. My next upgrade will be adding a Ford EDIS ignition. This comprises 2 main pieces. An ignition module and a 6 pack coil unit. Different plug wires too. The VR sensor triggers the module instead of the Microsquirt ECU. The module is wired into a few wires on the ECU. This will give me full control of the ignition timing in both non-boost and boost situations. HP and fuel mileage will both increase. I'll post some pics when I get these pieces mounted. I think I'll call this design "Gen 1". Engine view from left, engine runs and car is quite drivable. I'm working on the EDIS ignition now. Soldering up several wires. This unit will be triggered from the VR crank sensor and will allow me full timing event control. I should be starting it in a day or so. I'm very close. I'll post a picture then. As of last week Friday I was about to pull out the Microsquirt unit and hit it with a hammer. I could not get the EDIS ignition to trigger the Microsquirt unit at all. But then... a great guy from England helped me by pointing me to a site that has firmware written for the Megasquirt units by them, not by the Megasquirt guys. The site is MSExtra.com. I spent time resetting all my parameters. The car is running on the EFI and I have full control over the fuel and ignition. What a great feeling. So now I am in the middle of tuning the mixture. The ignition is close and will get dialed in once I have been on the chassis dyno and gotten the fuel really close. One of the nice perks is the lack of fuel smell when I open the engine cover. It starts right away and shuts off without running on. The picture shows the EDIS with the plug wires I made up. And the distributor cap, rotor and stock wires are missing. Looks nutty with the dizzy shaft rotating when it runs. Once I get this dialed in pretty well I'll post specs and settings needed for use with the Microsquirt unit. This little guy might be inexpensive but with the correct firmware is a very nice ecu. At this point I can definitely recommend it for Corvair use. Just a quick note. I'm still tuning the EFI. Mostly idle and cold start at this time. I still need to strap this to the chassis dyno and recheck the mixtures and spark advance. I did take a local Corvair friend for a ride yesterday. On the route back I decided to hit the throttle and pushed more than I had done so far. Well, the factory boost gauge went to 20. Damn, this car is fast. I'll be fearing for my rods and pistons if I keep this up. Well, not much to talk about with the tuning. Msextra.com has come up with a firmware update for the ecu which I need to install. And the Tuner Studio I use for tuning also got an update which I did install. More features which may help the tuning process. 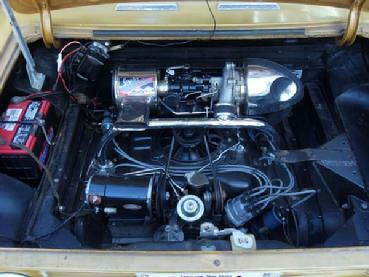 I had a friend from Austin send down a 66 Corsa he has been getting setup with EFI and the Microsquirt. I spent some time getting this to run. It'll go home this week and the Austin guy will tune it. I am getting ready to swap out the Spyder front suspension for a 1965 unit. I am fitting S10 2" drop spindles and disc brakes. Also using the upper and lower S10 ball joints. The upper and lower control arms have been sand blasted and satin black powder coated and fit with Clark's performance delrin bushings. They look great. Once I do a trial fit I'll get final measurements for the Flaming River steering rack. This car should be a blast to drive. I have been getting ready for the Performance Workshop in Indy this month. I spent 2 weeks swapping the heads on the Spyder. I'm using the 80hp small spring heads I wrote about on the big valve conversion page. These turned out great. During the swap I had to pull each head off for additional work. On the right side the top right head stud on #5 cylinder started to pull out of the block. So I repaired that with a "Time-Sert". On the left side I had a problem with the #4 exhaust tube. It was .062" too short and the exhaust manifold gasket would not seal. So off with that head to swap out the tube. All is back together and running. So time for more tuning. My idea with this head swap was to get dyno numbers before while the engine is stock. Then after the big valve heads are on do another pull and compare the results. I wanted to bring this data to the workshop for my tech talk. But... the first pull had dismal results. I started the car last Saturday and drove it for a while. I called the dyno shop to set up another pull. The second pull is not going to happen before I leave for Indy. Seems the bearing and shaft on the dyno roller failed and the dyno is being repaired. So, once I return from Indy I'll get the pull completed and post the before and after results here. As far as the dismal results are concerned there is a very good possibility the roller was already failing when my car was on the dyno. That happened 3 weeks ago and the bearing failed 2 weeks later. I'll talk with the operator and see if the data had been compromised. I'll post the info here. And pictures are coming on the head swap. Along with the front suspension upgrades when I get to that work. View of left big valve head with Ti retainers and beehive springs. Left head, rockers installed and adjusted. You should know what this is. I found the top right stud would not pull up to torque when installing the right head. So I removed the head and proceeded to drill out the offending threads. Tapped the new hole for a Time-Sert repair insert. I think these are the best type of thread repair. Torqued up great. I did have th run a die on the case end threads on the stud to reduce the size to fit this insert. I'm not man enough to run a stock .003" OS head stud into the steel insert. I talked with Ted Brown while at the Performance Workshop in Indy this spring. He told me he is no longer using a knock sensor on his EFI kit. He feels the sensor picks up normal Corvair engine sounds and retards the timing when not required. I had installed a knock sensor proir to our talk but this one in the pic is not hooked up to the ecu. It's just going along for the ride. Tapping top right head stud hole for a Time-Sert insert. Boo... Scared you, didn't I? I am alive and well. Been rebuilding several pairs of heads for customers. Those are finished and shipped to their respective owners and now I have 2 pair of race heads working. And several more pair of big valve conversion heads I'll be getting ready for the shelf. On my Spyder; I decided to pull the engine and replace the cam. But instead of buying a cam off the shelf I bought a piece of 8620 steel and turned a blank for a roller cam. Schneider Cam's sent me an email yesterday saying the cam was ready. It will arrive next week. I'll post a couple of pics then. This cam is a custom grind. 270 duration, .468" lift, zero overlap, 112 LSA. This will stop the exhaust pulsations from entering the intake which the cam in the engine now is allowing. These pulsations are causing the MAP sensor to vary wildly from a negative reading to a positive reading. Many times per second. The ECU is chasing this and is not tunable as such. I'll be rebuilding the engine later in July or in August. Depends on my work load. Roller cam blank, plated and ready to ship to the grinder. Roller cam returned from the grinder.